Get playing on your favourite games for your chance to win 1 of 10 humongous Christmas food packages! Celebrate the start of the rugby world cup by landing some smashing daily Cashback offers with Tiki! Travel down their Bingo road for your chance to win sweet rewards! The more Full Houses you win, the better the prize! Take part in the All Stars Tournament every Monday, Wednesday and Friday. Gather as many stars as possible as you try to win the CASH and BONUS prizes! Also enjoy today's Columbus Day Bingo Promotions 2015! From November 9th to November 15th enter the G-force Bingo event for the chance to win cash prizes! again. All are speed bingo games. Bank a draw entry on Deal or No Deal and you could win a luxury hamper and a £50 cash prize. There are one hundred £50 prizes to giveaway this week. Thursday is Thanksgiving and whether you're in the US or not, you can take part in the online bingo festivities! 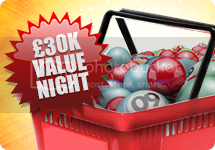 Win more for less with the exciting £30k Value Nights! Enter the Peggy’s Place room from 6pm to midnight every Thursday for a night filled with bargain bingo and big prizes! Every player wins every week! Get your tickets, grab your seat and you're guaranteed a show stopping win! Love to you and your families and good luck with the bingo! Merry Christmas my Bingo Balls! Winter Winners Warm yourself up this January with the chance to win £50 cash every day this month plus your share of £10,000! High 5 Bingo runs from January 4th to January 10th and offers 2 hours of speed games with big prizes on every 5th call. Check the schedule for each room and join for 2 hours of fast lane bingo. Win up to £1,000 on Pyramid: Quest for Immortality. There will be 51 cash prizes up to £1,000! Simply opt in and play a minimum of £10 on Pyramid: Quest for Immortality between Thursday 28th (00:01) and Tuesday 2nd February (23:59) to earn an entry into the Cash Prize Draw. Supercat has a cape full of freebies offers up to £100 cash! How to win: Deposit and play. 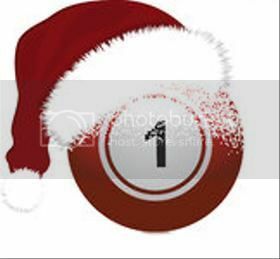 Receive a guaranteed gift when you Opt In. Prizes: Points, Spins, Bonuses, Cash! The prize money of the Rollover Fortune room will start at €1000 and increase every night with by €100 until someone wins. The jackpot will then start all over. Happy St. Patrick's Day LBB'ers! There are some fun games and promos running today. Win £100 in Asda vouchers, every Tuesday! It's time to go crazy for the lucky number 8 on Wednesday June 8th in the Crazy 8's chat game special. 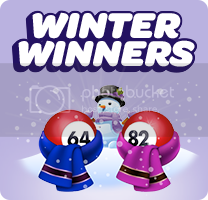 Join in the bingo fun in any of the bingo rooms between 8am and midnight EDT and if you bingo on any number with an 8 in it, you could be a Crazy 8 winner!